Although you’re sniffing around in the budget sight’s range of scopes if you’re considering this particular scope, you invariably still want to stretch each dollar as far as you can and get some good value regardless. So what exactly does a budget of less than $99 get you in a sight? That’s the question this Sightmark Ultra Shot review will answer and more. The Sightmark Ultra Shot Sight QD Digital Switch is definitely a budget sight, but it certainly doesn’t look like one with its hooded aluminum protective shield brought to life by its matte black finish. Something you might not expect of a budget sight is a considerably light weight, with the Sightmark’s 7.6 ounces coming in at about half the industry standard. Does this mean it has considerably fewer features though? Not necessarily — well certainly not if you consider the price. In fact, a top-of-the-line sight by the same manufacturer only has about 43% more features than this particular sight, but those extra features include things like extended battery life and a built-in laser (available only in a specific Sightmark). If you have about $50 or so more to spend, perhaps a look at the Sightmark Ultra Dual Shot Pro. It’ll be up to you to decide if it’s worth effectively paying more for a night vision mode because the built-in laser you’d otherwise get isn’t that good. If you want a laser — get a laser then, not a sight with a built-in laser that almost always appears to be an unnecessary afterthought. Can you do without night vision though because that’s something not inclusive of this Sightmark? Another great night vision mode alternative would be the Trijicon RMR 6.5 MOA Red Dot Sight, but this sight is considerably more expensive. So who is this budget-baby for and what exactly does it offer? Well, for starters you get a massive field of view — nothing less than 105 feet at 100 yards. That comes together beautifully with unlimited eye-relief and you might find yourself asking you whether you didn’t accidentally get a mid-range sight at a budget price. That said, however, this sight is not for everybody, particularly if you’re looking for a DOA sight, which this Sightmark isn’t. The Sightmark continues to punch above its budget price-range classification, impressively holding zero even if you somehow bump it. The only time you’ll ever need to zero it again is in the event that you change the reticle you use it with. In a practical deployment, you’ll particularly enjoy using this sight to zero-in on quick-moving targets, but ideally only at close range. It’s the ultimate companion for shotguns and rifles and it’ll fit your AR perfectly, with its use capable of being extended via its pairing with either a 3 or 5x magnifier from the same manufacturer. That will consolidate your accuracy by up to 100 yards. It’s also water-resistant, which is a feature that shouldn’t be confused with the device being fully submersible though. What’s the big deal with the digital switch? Not only is the fact that the switch is indeed digital something a little bit out of the ordinary, its usefulness extends to just how easily it allows you to work with the various brightness settings. This is particularly useful when the light intensity of the conditions under which you’re shooting change very rapidly and erratically. One only gets a true appreciation of this when you realize just how little reflection you get as a result of the matte black color of the device’s surface. There’s a bit of a binary issue with the Ultra Shot’s ability to hold zero though and that seems to be an either-or scenario where you either get a factory-shipped device that holds zero very well or you get one which seems to have some trouble holding zero. The batteries the device uses are also very small (tiny watch batteries) and it gets very annoying firstly trying to stack them in the correct direction and then secondly having to contend with the batteries’ seemingly variable performance (the sight seems to take a while to fully “take” the batteries’ current and can, therefore, turn off inexplicably). The batteries also don’t last very long and these tiny watch batteries can prove to be expensive and hard to find in the right size. 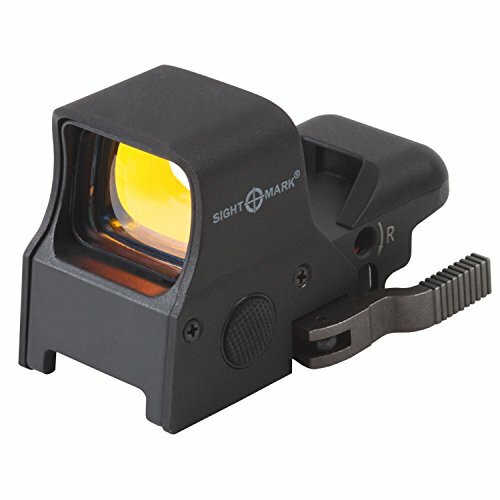 Click here to view other options featured alongside this sight in our review list of the best red dot sights for ar 15s. Versatile — works well with Sightmark magnifiers. If you can currently only afford a budget sight, hopefully, this Sightmark Ultra Shot review opened your eyes up to the value you can uncover from even those sights that don’t promise the world but deliver something very close to it at a great price.